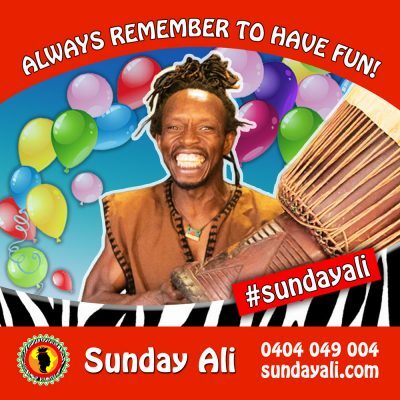 Sunday Ali is an African Entertainer based in Brisbane Queensland Australia. His shows and performances is a fresh new interactive entertainment of Drumming and Dance show that undoubtedly will make any event special, as for High Schools, as for Colleges and Universities. For example, performances can be for pure entertainment for your school/college or university community, or as an interactive performance where students join in. In other words, Sunday Ali can perform with his African Drum and Dance Show at your school/college/university assembly, multicultural day, school fete, or any other event you may be organizing. African Drum and Dance Show may combine a workshop and performance together in order to create an interactive performance for students and teachers. Moreover, after a class workshop, or series of school workshops, it is possible to put on a show for the whole school to enjoy. Let’s make our students and everyone happy and humble! Contact Sunday Ali today. Finally, our show package is for up to 50 students including all show drums and musical instruments to make our show great. However, on ordering, you can add additional student numbers beyond 50. Once all is confirmed, you will receive a booking confirmation by email. For any questions, please send us a message on our contact page.